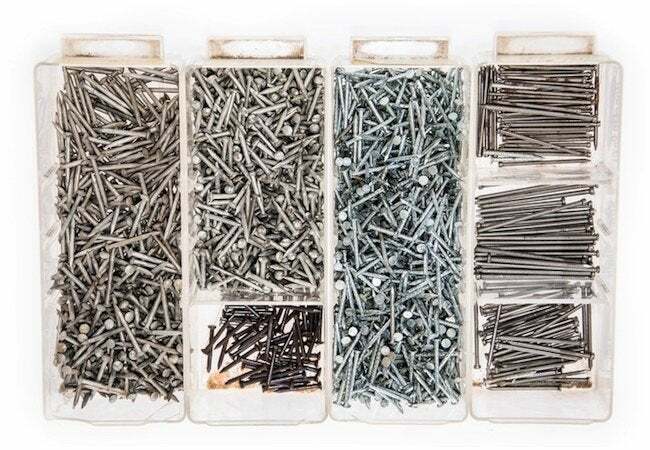 Though nails and screws are sometimes used interchangeably, there are pros and cons to each. Read on to learn more about which types of applications call for which types of fasteners. Nails or screws? Sometimes it’s difficult to decide which to use for a given do-it-yourself project. The next time you need to choose between the two, bear in mind the following guidelines. If you’re joining two pieces that are going to be under tension—in a porch railing, for example, or when building kitchen cabinets—then screws are the better choice. Also, since screws are easier to remove, they’re often superior for temporary fastening jobs. Finally, if you’re working with a fragile material like plaster, you may wish to use screws because driving them into place causes much less vibration than pounding in a nail would. Nails have pluses, too. For one thing, compared with screws of the same length and gauge, nails are usually stronger. That makes them the preferred choice for withstanding “shear” pressure—that is, keeping the fastened pieces from sliding past one another. In most cases, nails are also less expensive. And particularly if you’re working with a gun, nails can be secured quite quickly. Speed makes them ideal for framing, flooring, roofing shingles, siding and sheathing.